FILM: THE UNBELIEVERS ATTACKS RELIGION! On Monday, April 29th, the documentary The Unbelievers premiered in Toronto, Canada, with sold-out shows. Prof. Richard Dawkins (evolutionary biologist) and Prof. Lawrence Krauss (theoretical physicist) have worked the debating circuit together for years to defend the forces of reason and truth against the forces of ignorance and superstition, but this film will perhaps reach beyond their usual hunting ground of the university lecture halls. As far as Frogbook.com can gather, their main message (among other ideas) is a bold and controversial one: religion is nonsense and it should be eradicated. ~ Dawkins & Krauss promote film in Toronto. "Nothing is sacred." We at the Frog Blog have vigorously (and sometimes viciously) attacked those religious firebrands who promote erroneous ideas in the name of religion (like Creationism and the Apocalypse). But their ignorant actions are by no means a reflection of all religions in general; many credible religious authorities around the world also believe in scientific ideas such as Evolution, the Big Bang Theory, and other truths. ~ The Vatican supports Evolution. Hardly a voice of moderation, Pat Robertson of the 700 Club once suggested that Venezuelan president Hugo Chavez should be assassinated; and even he thinks that the Earth cannot possibly be only 6,000 years old! Once religion crosses a line to enter the realm of delusion and then goes on to challenge long established scientific wisdom, then that's when society starts to break down as truth, knowledge, logic, and justice go out the window. What you end up with is blind theocracy. ~ Pat Robertson denounces Young Earth Creationism. FrogBook.com has said before that religious stories, such as the myths and fables in the Bible, are useful tools to relay certain allegorical messages and morals to the people. And many religious authorities know this. It is however a big mistake for some renegades to teach Bible fantasy as literal truth. That's just wrong. Have you ever noticed that after the advent of the tape-recorder, the camera, and the video, ALL supernatural phenomena such as the rising of the dead and floating angels have suddenly disappeared off the face of our planet? If religion wants to survive, it must purge those idiots who pursue the literal interpretations of the scriptures (they are fooling no one but simpletons) and start to make their ideas more sophisticated and relevant. Then they should integrate these concepts into a modern, complex, and scientific world. As Prof. Krauss has said, religion is already in its death throes in the West. By stubbornly clinging on to rubbish (such as the idea that all the different species of dinosaurs that had ever lived were once inside Noah's ark) religion as a whole will only die in the long run all over the world. ~ Arguing for the destruction of religion. While FrogBook does not attack religion but only those imbeciles who insult people's intelligence in the name of religion, we however are not criticizing Dawkins' and Krauss' attempt to attack religion as a whole head on. As Dr. Krauss has said, it is not wrong to question or to ridicule ideas. In fact, scholars and scientists have done just that to one another's ideas for hundreds of years. This is how we create this wonderful thing called SCIENCE! 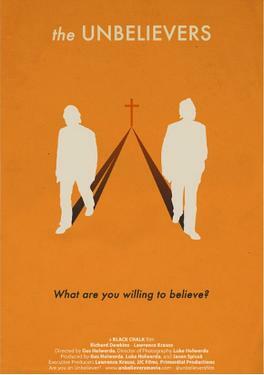 ~ Offical trailer of "The Unbelievers" (2013).